The proposed revisions to the Massachusetts Contingency Plan (310 CMR 40.0000) are now available on MassDEP's website at: https://www.mass.gov/lists/2019-proposed-mcp-revisions and a Public Hearing Notice has been published in the Massachusetts Register. This will kick-off an extended 3-month long public comment period that will end July 19, 2019, and will include five public hearings at MassDEP Offices across the state and additional meetings as needed/requested. The purpose of the proposed revisions is to update and clarify existing provisions for the notification, assessment and cleanup of oil and/or hazardous material contamination in the environment to ensure that actions are performed in a timely manner, are appropriately monitored and documented, and achieve of a level of No Significant Risk that is protective of public health and the environment. The addition of RCs and Method 1 standards for six perfluoroalkyl substances-Perfluoroheptanoic Acid (PFHpA), Perfluorohexanesulfonic Acid (PFHxS), Perfluorooctanoic Acid (PFOA), Perfluorooctane Sulfonate (PFOS), Perfluorononanoic Acid (PFNA) and Perfluorodecanoic Acid (PFDA)-emerging contaminants of concern for exposure in drinking water. Questions about the public comment process, the meetings/hearing and/or the proposals may be emailed to [email protected]. The LSPA's Regulations Committee will spearhead the LSPA's response to the public comment period; we will send an email to LSPA members with details and deadlines early next week. The LSPA Board realizes the need for an LSPA PFAS Task Force to cover the ever-changing and consuming topic of PFAS, and are in the process of setting out goals and a charter. We would like to gauge interest and ask for volunteers now so that we can start to get organized. This sense of urgency stems in part from the formation of a MassDEP PFAS stakeholder group, and the fact that this group already had their first meeting. Information on the MassDEP PFAS stakeholder group can be found here. The LSPA should have been on the invite list since we submitted a letter at the "PFAS Petition" hearing. We have been in touch with the Drinking Water Program, Bureau of Water Resources who tells us the next stakeholder group meeting will be the week of June 17 - no definite date yet. Attending these stakeholder meetings (which are open to the public) will be an initial key task for the group. Please contact Wendy Rundle at [email protected] if you would like to join the LSPA Task Force. Many homeowners do not have the financial means to pay for costly cleanups. The backing of homeowners insurance companies is critical to make cleanups financially viable and to assure that home heating oil spills are timely and properly addressed for the protection of the public and the environment. LSPA's March 2019 Member Newsletter has been published! Table of Contents is listed below. Please log in to your account and visit Member Materials to view the full newsletter. AEPMMs and RMRs: What? When? Where? Why? Environmental Workshops is offering training events on Vapor Intrusion. Each half-day workshop is presented together with a casual networking event. Click here to find background information, or go to find a specific event page. While the workshops are free of charge for all attendees, registration is required. For those interested, here are the upcoming workshops in our area. If you have any questions, please contact EnivroWorkshops directly. 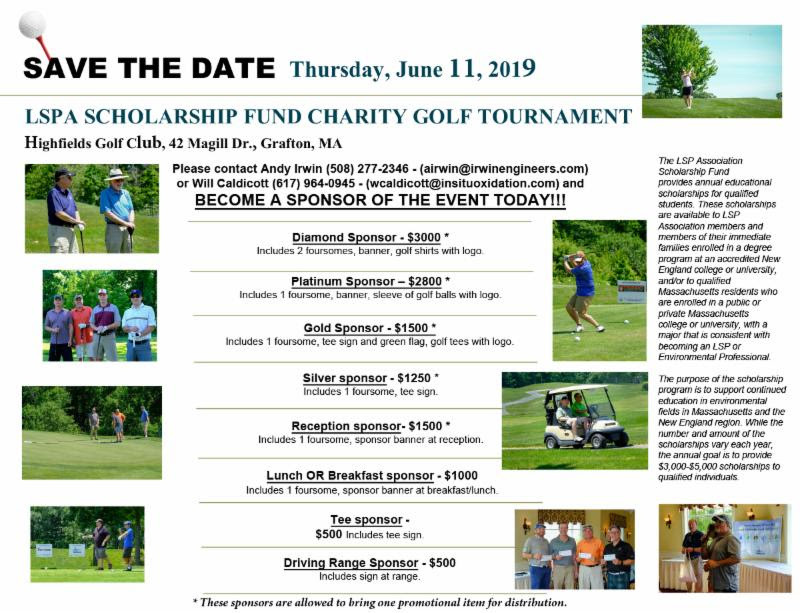 The LSPA Scholarship Fund will be hosting its 6th Annual Scholarship Fund Charity Golf Tournament on June 11, 2019, at the Highfields Golf Club in Grafton, MA. As in previous years, the Scholarship Fund is looking for sponsors and participants (see details below). BECOME A SPONSOR OF THE EVENT TODAY! Although we accept both checks and credit cards, please note that a larger portion of your contribution will go to the Scholarship Fund if you pay by check. Please click on the image below to enlarge for event and sponsorship details. Please contact Andy Irwin at 508-277-2346 or Will Caldicott at 617-964-0945 and become a sponsor today! Society for Environmental Toxicology and Chemistry-North Atlantic Chapter (NAC SETAC) will host its 25th Annual Meeting and Short Course at the University of Massachusetts Boston on April 8th and 9th, 2019. The short course will focus on the use of equilibrium passive sampling for environmental investigations. Registration is now open, here is a link to the preliminary schedule of events. The American Council of Engineering Companies of North Carolina (ACEC/NC) and Groundwater Professionals of North Carolina (GWPNC) invites you to attend the inaugural PFAS and Other Emerging Contaminants Conference, from Tuesday, April 23 through Wednesday, April 24th at the Marriott City Center in downtown Raleigh. This will be a seminar style conference, and is structured to be a "practitioners guide to emerging contaminants". Our target audience includes geologists, environmental scientists, and engineers in the industry of environmental assessment and remediation; and is appropriate for regulators, consultants and service industry professionals. Please click here to view the conference agenda. LSPA Emerging Professionals' Annual Trivia Night! The LSPA's Emerging Professionals Committee hosted its annual "Trivia Night" on Wednesday, February 20, 2019, at Dorchester Brewing Company in Dorchester, MA. Thanks to everyone who joined us for an evening of general trivia! A night of good food, good drink and good company - we already can't wait for next year's event! And thank you to our event sponsor, Alpha Analytical, who awarded prizes to the winning teams. The LSPA submitted this response to MassDEP's invitation to offer written feedback on the "PFAS Petition" by the Conservation Law Foundation and Toxics Action Center. Read the letter here. As you know, MassDEP received a “Petition for Rulemaking to Establish a Treatment Technique Drinking Water Standard for Per- and Polyfluoroalkyl Substances” on October 25, 2018 from the Conservation Law Foundation and Toxics Action Center. In accordance with regulatory requirements under 310 CMR 2.03 and 2.04, MassDEP held a public meeting on January 16, 2019 to consider the petition and to take comments on the petition. This opportunity allowed for representatives of the Conservation Law Foundation and the Toxics Action Center to present their views on the petition to 71 participants attending the meeting in person, and more than 80 watching via on-line stream. The public meeting also allowed for 21 stakeholders to formally offer their views. In addition, MassDEP received written comments from 45 different individuals and organizations. MassDEP greatly appreciates attention to this important matter from the petitioners, and the agency is very appreciative of the participation of all stakeholders through their written and oral comments, and attendance and viewing of the public meeting. The LSPA has heard back from MA Executive Office of Energy and Environmental Affairs (EOEEA) Secretary Matt Beaton's office that "Commissioner Suuberg from MassDEP has reached out to multiple environmental organizations asking for recommendations for this seat." This is in response to a letter the LSPA sent urging that the seat, vacant for 5 years, be filled. Read the letter here. NBC10 Boston Segment, "Home Heating Oil Spill Nightmares"
Thank you to Ryan Kath and the team at NBC10 Boston for this piece illustrating the serious challenges of home heating oil releases, especially for those who are uninsured. We expect two more parts to this series, with the final part focusing on legislation that would require insurance companies to provide specialized liquid fuel release insurance riders. While we can't comment on the specifics of this Blackstone property, we can say that Licensed Site Professionals (LSPs), attorneys, the Massachusetts Department of Environmental Protection (MassDEP), and the LSP Association (LSPA) hear regularly from homeowners who are overwhelmed and desperate about how they will afford to clean up home heating oil releases on their properties to meet the requirements of the State’s environmental regulations. Home heating oil spills are emotional and difficult for all involved. Many homeowners do not have the financial means to pay for costly cleanups, and MassDEP does not have the public funds to do this itself. The backing of homeowners' insurance companies is critical to make cleanups financially viable. The LSPA is working with state legislators to mandate that insurance companies provide coverage to homeowners using oil heat - just like they do for homeowners using electric, gas, and other energy sources, and just as most homeowners would expect when purchasing insurance. Special Report Tonight on Boston Channel 10! Be sure to watch this special report tonight on Boston Channel 10 on the impacts of leaks and spills from home heating oil tanks. The financial, emotional, and environmental consequences can be dire. Uninsured homeowners are hit especially hard. Most people are surprised to learn, usually too late, that their insurance policies exclude this coverage. Check out this newscast tonight at 11pm. And on Tuesday, February 5th early evening news. Channel 10 Boston and Ryan Kath. The LSP Association (LSPA) is working with Senator Anne M. Gobi (D-Spencer) in this new legislative session to pass a bill that would require insurance companies to provide coverage for residential heating oil spills. Senator Gobi, Chair of the Joint Committee on Environment, Natural Resources, and Agriculture, is the primary sponsor of the bill (Senate Docket No.975), which is the same language as her 2017 bill. The more sponsors of the bill - the better. We are asking you, LSPA members and friends, to write to your State Senator to urge her or him to sign on as a bill co-sponsor. This is the week to get it done. As a resident of (your address) and your constituent, I am writing to respectfully ask you to join on as a co-sponsor to Senator Anne M. Gobi's bill, Senate Docket No. 975. This bill would make it mandatory for insurance companies to provide coverage for residential heating oil spills. This bill would provide important consumer and environmental protection in the unfortunate event of a home heating oil leak or spill. (If you have first-hand experience assisting with residential spill remediation or know someone who has experienced a spill, it's good to share that). I encourage you to consider co-sponsoring Senate Docket No. 975. For more information about the LSPA's bill, please read more here.